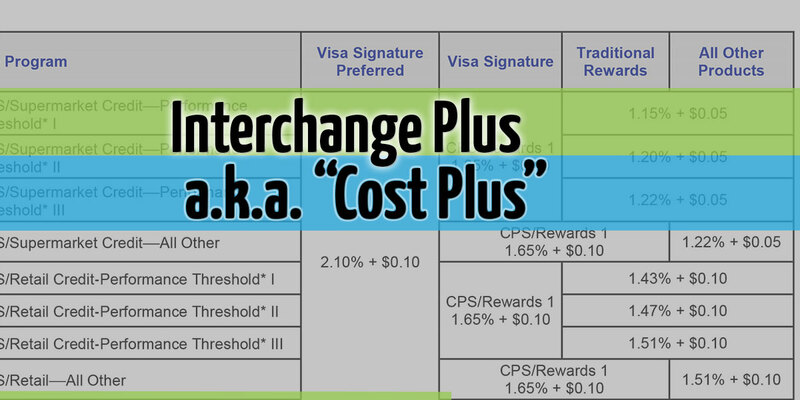 Interchange plus pricing is a more advanced pricing structure than tier-based pricing. The reason is simple. The merchant account provider simply passes through their cost, i.e. interchange, and then adds a markup to cover other costs associated with having a merchant account. Merchant account providers use this rate structure to assess interchange fees and other costs associated with having an open merchant account. In this post we’ll look at the components of interchange plus pricing. After interchange costs are “passed through” to you a provider markup is charged. Your merchant account provider bills you the exact interchange fee that they pay, so there is no markup. Each interchange category is then listed on the month end statement, so the statements can become quite lengthy and confusing if you don’t know which charges to look for. The reason it becomes confusing is that most people don’t have the time to memorize and remember interchange categories so the statements are filled with numbers that seem to be haphazardly thrown together and charged to you. The image below is the provider markup section of a merchant account statement and will show you a sample markup of 0.35% and a Visa/Mastercard transaction cost of $.06. This is a snapshot of page 2 of a 6 page statement. Interchange plus programs emerged to simplify the provider markup on a particular account. Interchange plus pricing programs are more prominent in certain high volume industries. Below is a sample of the same statement that shows just two of the many interchange levels that show up on an interchange plus merchant account statement. This is the pass through section of the statement. These are the exact charges that are billed to the merchant account provider. Every merchant account provider assumes the risk of loss when underwriting and approving an individual merchant. This, in part, is the reason for provider markup. A typical markup for interchange plus pricing is usually between 5 to 90 basis points based on volume, type of business, and how the transaction is processed. Similar to tier-based rate programs, interchange rate categories and effective rates will fluctuate from month to month based on credit card types that are accepted each month. Provider markups are very minimal compared to the total cost of a transaction. Let’s say the provider markup is 0.20%. The chart below will walk you through the behind the scenes transaction flow of what gets you to the final charge that is assessed. In this example the total cost to you is $1.95 and the merchant account provider keeps only $.20 of that total charge. The rest of it, the interchange fee, goes back to the cardholders issuing bank. For more on how interchange works click here. While many internet forums and websites will claim that interchange plus is the best pricing model due to it’s transparency of fees, it’s not always the correct choice. Other factors as mentioned before, such as monitoring effective rate, come into play and are more important to business owners. Additionally, I have had countless business owners just like you request from me over the years to make their statements easier to read. With that request in mind, interchange plus is not the correct recommendation.